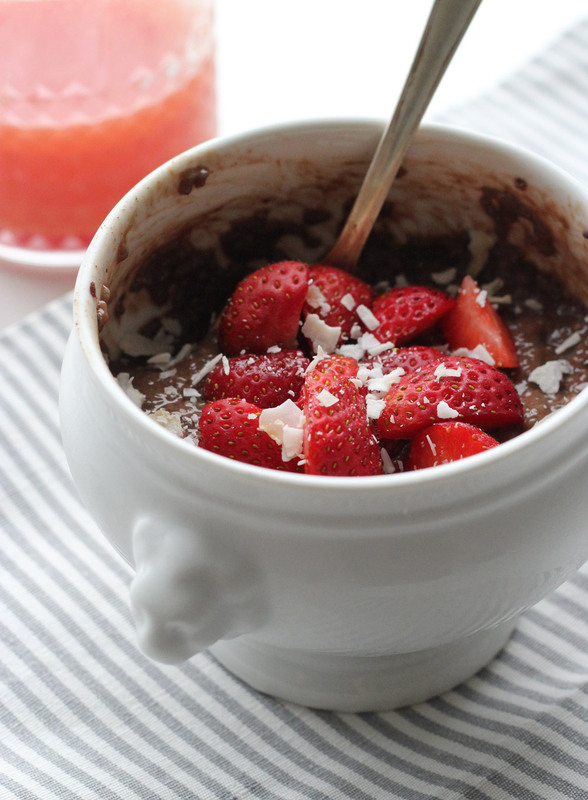 There is no surprise to anyone that I love chia pudding for breakfast ro as a snack. I try to make varieties of it, as its so easy to make and for me, this is a great pre or post-workout snack. This is one that I’ve made a few times and enjoy during summer, with fresh strawberries and coconut flakes with raw cacao. Since there is plenty of magnesium and other nutrients in raw cacao powder, its a perfect for my work out days. Soak 6 dates in plant-based milk in a bowl overnight. Add cacao powder to the bowl. Mix until smooth. Mix chia seeds and spices with the plant-based milk of your choice in a bowl. Cover the bowl with a lid, plastic wrap or similar to protect the pudding and place the bowl in the fridge for a few hours, until the seeds have accumulated most of the fluid. You may need to whisk the chia seeds around once or twice, while they swell up, so that the pudding becomes even and that no chia seeds get stuck in the bottom of your bowl. The consistency should be like a pudding, the shell of the seeds swell and accumulate the plant-based milk.